The number of immigrants entering the UK is far higher than government figures show, a new report suggests. Economic consultancy Capital Economics claims that net immigration in 2005 was actually 400,000, rather than the official figure of 185,000. It also says 50,000 people from Romania and Bulgaria could arrive in 2007. But a Bank of England report released on Thursday said there was "little evidence" that migrants made it harder for UK workers to find employment. The Capital Economics report says that net migration is "probably at its peak and set to slow", falling from a projected 410,000 in 2006 to 200,000 in 2010. 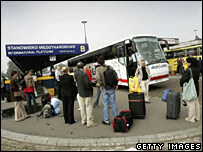 It estimates that 780,000 people emigrated to Britain in 2005, compared to the official figure of 564,000. When subtracted from the estimate of how many left the country that year, the report arrives at its figure of 400,000 people who entered the UK legally. It does not account for illegal immigrants. Economists have already lobbied the government for more accurate immigration figures, so that the effect of the influx of workers on the nation's economy can be better judged. The Bank of England's report also dismissed the idea that recent arrivals have come to the UK to claim benefits or that they pulled down wages. It said the 0.8% unemployment rise during the previous 18 months was not greatly connected with the arrival of about 500,000 Polish and ex-Soviet bloc workers. The Home Office has said migrants have helped economic growth in the UK. Ten accession nations - Malta, Cyprus, Poland, Hungary, Slovakia, Slovenia, Latvia, Lithuania, Estonia and the Czech Republic - joined the EU in 2004. The Bank of England paper comes after pressure group Migrationwatch UK questioned the benefit of migrants by saying their economic benefit was equal to 4p a week for each person in Britain. Romania and Bulgaria also recently entered the EU, but their citizens will only have limited access to employment in the UK.